Still on the blue kick. Outfit from Ivalde, full of charming detail. Necklace and earrings from *DelEmma*. I got it at the jewelry fair. Ring from Genesis, also a fair find and both the metal and the stone are color-change. I really appreciated how low-lag the fair was this year. It must have been hard on the designers but the effect was well worth it. I wound up going back a couple of times. I got the skin during PopFuzz’s 100L sale (color-change brows). I love the eyes on this skin but the lips were a little pale for me. I wish they were color-change too. The hat hair is a prize from a hunt by **DP**yumyum. It comes with (shown) and without hair and both hats are color-change. So adorable. I am probably the last person to blog this dress by Ivalde but my original photos had those icky lines through them. It’s perfect with this new hair by Curio (Please may I have some more?) and shoes from enkythings. The earrings are new Miriel! and the adorable pearl locket is KessKreations. You can add your own pictures, change the metal, and it also comes in black pearls. I should also mention the pose is from Torrid (I don’t do that near enough) Basically I buy stuff from every release she does. You know I’ve always loved the Breakfast at Tiffany look, but I’ve watched it 5 or 6 times and still don’t understand the movie. 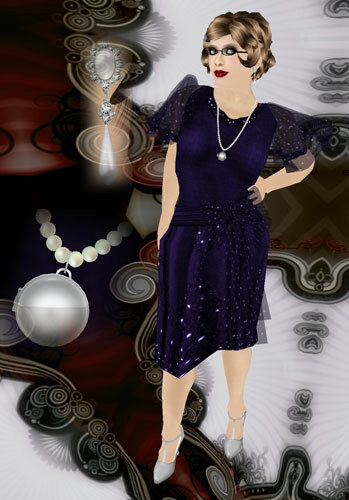 You are currently browsing the Ivalde category at SL Fashion Notes.